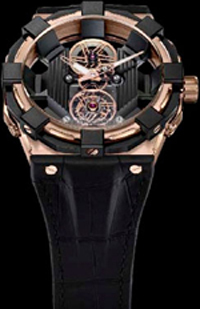 Concord is a novelty C1 BlackSpider Tourbillon Rose Gold. Swiss watchmaker Concord has expanded its collection of novelty BlackSpider C1 BlackSpider Tourbillon. Swiss watchmaker Concord has expanded its collection of novelty BlackSpider C1 BlackSpider Tourbillon. Compared to previous models, the new watch case is made of 18-carat rose gold. Shell diameter of 47 mm, thickness -13, 55 mm. A characteristic feature of the collection is the original design BlackSpider buildings, which resemble the shape of a spider. The special housing design with 8 fixtures with the same number of screws can fold the sides, down to the “bottom” of the dial. With this design, the body, increasing the sense of depth. The black dial is decorated with ornaments in the form of vertical stripes. He inserted two skeletonirovannye arrows coated with fluorescent material. At the top of the dial, the label of “12 hours“, visible components are calibrated with 105, and at the bottom – in the “6 o’clock” – is the tourbillon. The work of the mechanism, which is provided with the model can be seen through the transparent case back. Caliber with manual winding assembled by 19 stones, has a frequency of 21,600 vibrations per hour, 72-hour power reserve. Hours C1 BlackSpider Tourbillon Rose Gold available on matt black rubber strap. It is attached to the body with four self-locking screws.